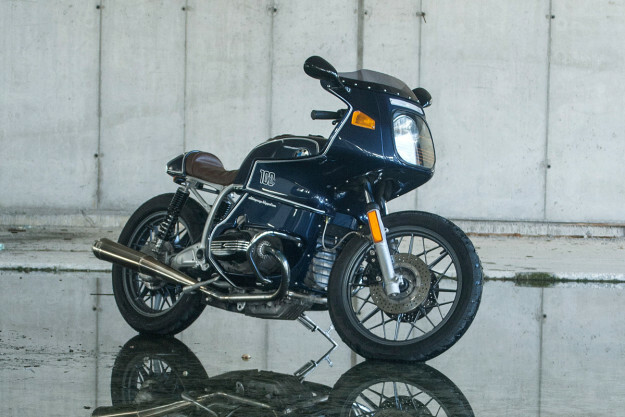 Back in 70s, the BMW R100 RS was one of the coolest motorcycles you could buy. It was elegant, predictably expensive, and accomplished at its prime task: eating up the miles in absolute comfort. 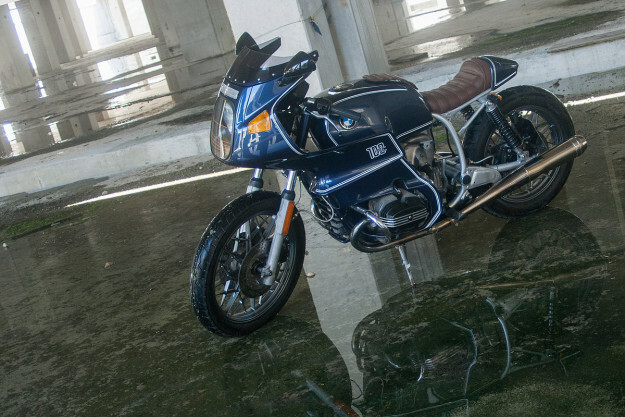 A well-maintained R100 RS is still a superb touring machine, three decades on. But visually, it hasn’t aged too well. 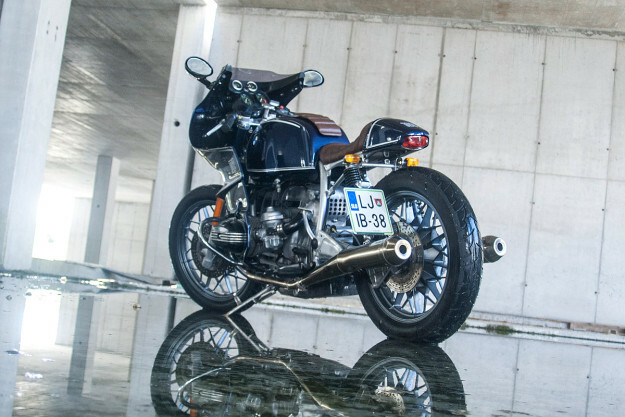 The seven-piece fairing and the wedge-shaped tail unit look more than a little ungainly. 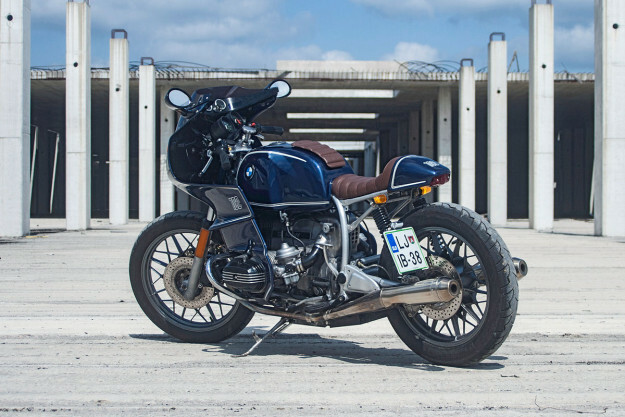 It doesn’t take much to give the R100 RS a facelift though, and that’s what Slovenian builder Luka Cimolini has done here. There’s something of an ‘outlaw’ vibe, which will turn some folks on and others off, but we’re sold. 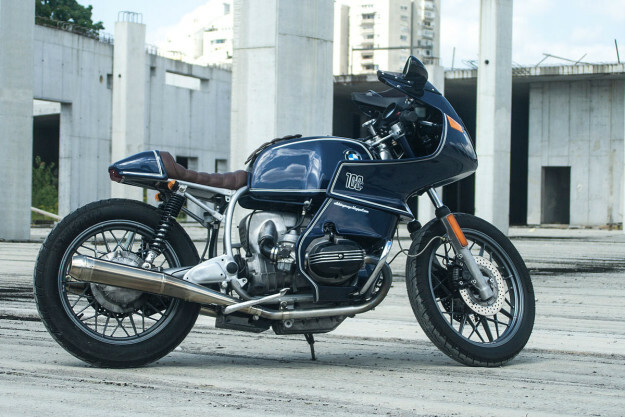 The BMW is a first generation R100 RS. (It’s a 1982 machine, which means it has the Brembo rear disc brake upgrade.) Luka has switched the suffix from RS to RC—from Reise Sport, meaning Travel Sport, to Reise Custom. He’s handy with the tools, so he’s treated the 980cc boxer twin and gearbox to a complete rebuild. The plastic airbox is gone, replaced by a more attractive item from a late 70s R80/7. Luka’s also lowered the bike slightly, by around four centimeters. He’s fitted an extra fork clamp to make it easier to adjust the fork height, and slightly modified Kawasaki clip-ons are now attached to the top of the fork tubes. At the back the upper suspension mounting point is raised. 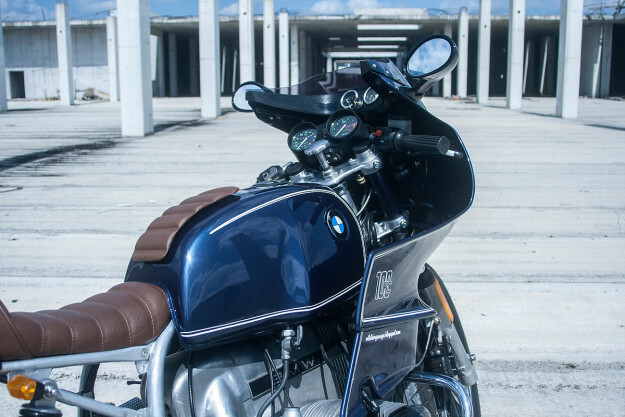 It makes the R100’s center of gravity lower, but there’s little difference to ride comfort. The forks and shocks remain standard, but have been cleaned, serviced and refinished. 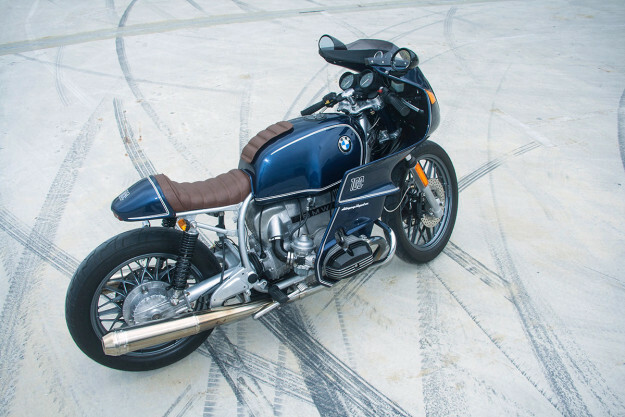 The biggest change at the back is a complete new subframe with a fiberglass rear end and seat, topped off with a Lucas 564 rear lamp. 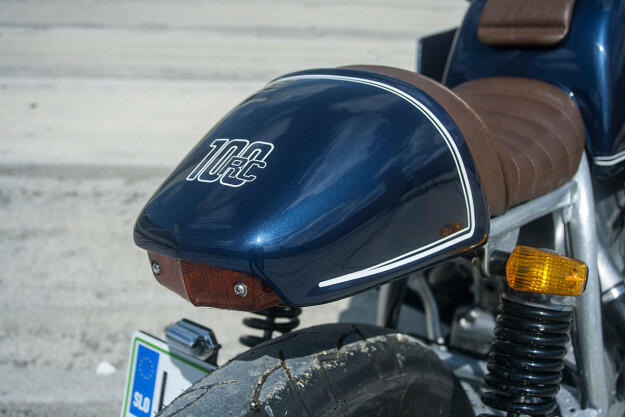 It’s a classic café racer tail that matches the angular fairing surprisingly well. Agreed, it’s not as practical as the factory-supplied thickly padded sofa, but it’s certainly more pleasing to the eye. So Luka has trimmed the sides—a common mod amongst RS riders who find the heat from the engine too much—and bobbed the windshield. He’s also vented the fairing in front of the engine with slats to improve cooling. 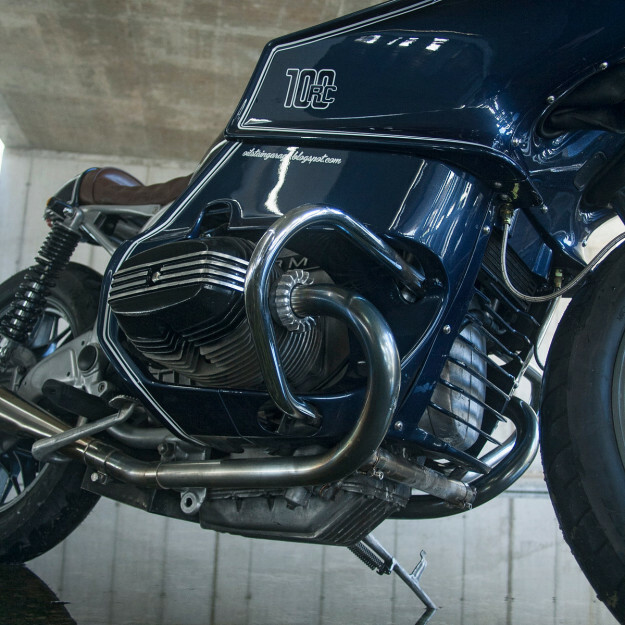 The stock R100 RS has unusually long stainless steel mufflers, which normally extend beyond the rear tire. They’re now shortened a little so that the end point of the bike is the Michelin Pilot Activ tire. The result is a stunningly effective ‘resto-mod’—keeping the elegance and functionality of the original machine, but massaging it to suit 21st century eyes. It won’t win favor with purists, but we love Luka’s style.